On a night when all eyes were watching Inland Empire 66er Alex Meyer, the pitching prospect acquired by the Angels in the Hector Santiago trade with the Twins who is working towards a September call-up to the big league team, it was outfielder Michael Hermosillo who made everyone take notice. 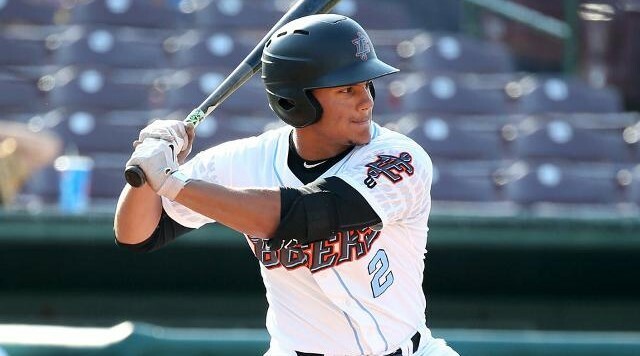 The 21-year-old Hermosillo was playing center field and batting lead off for the 66ers, and he went 4-for-4 with two doubles, a walk, a stolen base, and five runs scored in the 10-4 win over the Rancho Cucamonga Quakes. Hermosillo, who was drafted by the Angels out of high school back in 2013, is now batting .323 with five home runs, five triples, 15 doubles, and nine stolen bases over 72 games split this season with the Low-A Burlington Bees and the High-A 66ers. Meyer faced just 13 batters and left the game after 2.1 innings pitched. He gave up three hits, a walk, and a hit batter while striking out three Quake batsmen. His first strikeout, however, was a sweet one, as it came against Dodger outfielder Andre Ethier, who is with Rancho on a rehab assignment. Update 9/1/16: It was just announced that Hermosillo and five other Angel minor leaguers will play in the Arizona Fall League for the Scottsdale Scorpions.